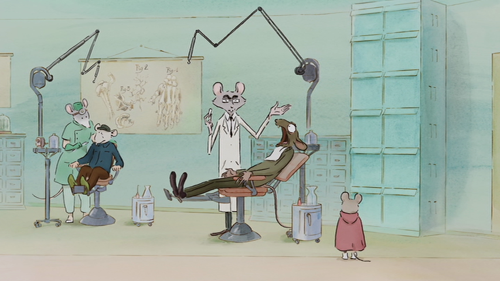 Please Note: The stills used here are taken from the DVD portion of Ernest & Celestine. 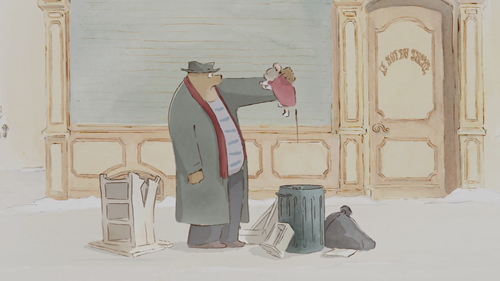 In the animated charmer Ernest & Celestine, a mismatched pair forge an unlikely friendship as fugitives in a watercolor-dappled world - what's not to love about that? Arriving on DVD and Blu Ray in both its original French and a good English-language dub, Ernest & Celestine is another visually splendid winner from GKIDS, the distributors responsible for importing similar Euro-animated features like The Secret of Kells, Chico & Rita, A Cat In Paris and Approved for Adoption. Ernest & Celestine opened to rave reviews in its native country in 2012, although it stayed under the radar for most Americans until receiving a Best Animated Feature Academy Award nomination in early 2014. The statuette ultimately went to Frozen since, hey, it's Disney and it made a zillion dollars - but I might be in the minority in preferring the understated E&S to that bloated faux-Broadway extravaganza. Not only is its story more concise and broadly appealing (based on a series of beloved books by the late Belgian author Gabrielle Vincent), but it also has the lovingly crafted feel of being made by actual human beings and not some faceless corporation interested in how many dolls, toys, etc. they can piggyback off its success. Superficially, E&S appears as cute and cuddly as any classic Disney flick, but it also has enough individuality to triumph on its own merits. 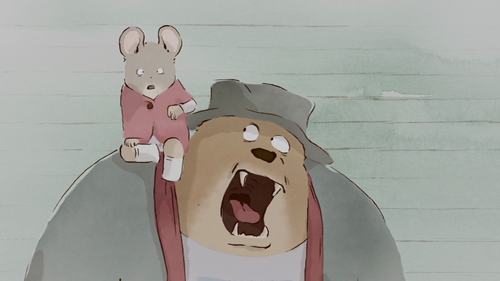 Ernest and Celestine tells the story of two critters - a beastly yet lovable bear and a creative little girl mouse - who come to embody the fact that friendship can blossom from the most unexpected places. It begins with the orphaned young mouse, Celestine (voiced by Pauline Brunner in French; Mackenzie Foy in English), being scolded by the orphanage's stern old headmistress for losing herself in her drawings and ignoring the warnings about the hungry bears outside with a taste for young mice. Like the other kids, Celestine is assigned with collecting bear teeth for a dental academy to use on fellow mice in their underground rodent colony. The mouse children retrieve the discarded teeth of bear children in the bear colony above - Celestine just wants to draw, however. The clever mouse sees a way out of her predicament when coming across a rumpled bear street musician, Ernest (voiced by Lambert Wilson in French; Forest Whitaker in English). Ernest initially sees Celestine as a snack, but she helps him out of a jam and gets him fed aplenty by breaking into a local sweet shop. Ernest, in turn, helps Celestine steal a bagful of bear teeth from another shop (which, coincidentally is run by the wife of the sweet shop proprietor). 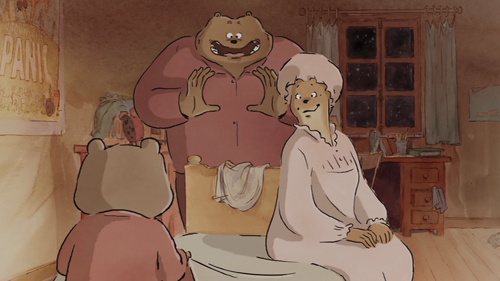 With a horde of bear and rodent authorities on their tails, Ernest and Celestine hide away in Ernest's secluded country cottage and eventually discover that what makes them "deviants" in normal society binds them together. Like a storybook vividly coming to life, Ernest & Celestine ambles along with a sweet message of following your dreams and looking for friendship whenever it reveals itself. 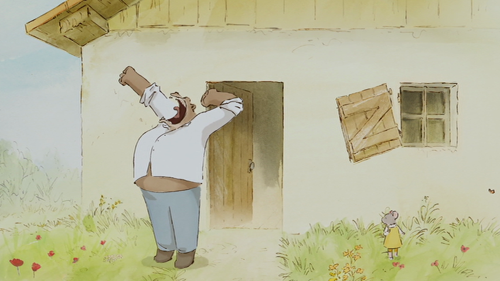 A good portion of Ernest & Celestine's character comes from co-directors Stephane Aubier and Vincent Patar, who bring to this film the same delightful randomness and rapid-fire pacing seen in their debut, 2009's A Town Called Panic. Unlike the herky-jerky Panic, however, this film boasts some beautiful, classically done animation. It uses CGI in an interesting way, combining hand-painted watercolor backgrounds and textures with computer-generated characters for an expressive, old-fashioned feel (in the Blu Ray's bonus material, co-director Benjamin Renner cites the illustrations from the original A. A. Milne Winnie the Pooh books as a strong inspiration). Apparently the Gabrielle Vincent books this story is based upon are still fairly popular in Europe, although one of the film's foremost pleasures for this viewer was the very unfamiliarity of the characters. The results are gentle and heartwarming, and wacky, at the same time. The home video edition of Ernest & Celestine comes with both the original French-language soundtrack and a well-produced American dub using the talents of Forest Whitaker, Lauren Bacall, Paul Giamatti, William H. Macy, Megan Mullaly, Nick Offerman and Jeffrey Wright. This option may well be the better choice for first-time viewers to optimally experience E&C's fine visuals. Although the film is rated PG for a mildly scary scene involving fire, its uplifting message and gentle spirit is well-suited for kids and adults of all ages. Ernest & Celestine used digital technology to give the imagery the tactile feel of pencil sketches and watercolor paintings in motion. Not only is it realized nicely in the film, Cinedigm's Blu Ray edition brings out the film's detail and subtle coloration in every frame. The 16:9 transfer taken directly from the digital source preserves the sharpness in the animation (edges are crisp without looking too "digital"), while the colors and background imagery is pleasantly lush. For those waffling between Cinedigm's standalone DVD edition ($5 less MSRP) and this DVD/Blu Ray combo pack, the enhanced resolution of Blu Ray makes a noticeable difference - it's lovely. The dual-format release of Ernest & Celestine contain a spacious DTS-HD 5.1 Master Audio for both the English and French-language soundtracks. The mix doesn't do much in the way of surround effects, although it's atmospheric with a pleasant, crystalline balance between clear dialogue, sound effects and a whimsical score by composer Vincent Courtois. "Pretty" is the word I'd use to describe it. The English dub is the default setting on both discs, while optional subtitles are provided in English SDH and a separate translation for the French soundtrack. C'est bon - an Interview with Director Benjamin Renner, spoken in English, discusses the production from concept to screen. In French with English subtitles, the 51-minute Making of Ernest & Celestine details the filmmakers' challenge of faithfully adapting a beloved series of books while bringing some new pizazz to the project. It also contains production drawings, early animated studies and interviews with the French actors supplying voices. The Blu Ray-only Feature-Length Animatic shows production drawings while the French soundtrack plays. Trailers for this and other animated releases from GKids round out the extras. The enchanting friendship depicted in Ernest & Celestine goes down like a mugful of hot chocolate with marshmallows on top. Aficionados of expressive animation would have to have a heart of stone not to enjoy it, although Cinedigm's home video version contains a nicely-done American soundtrack for the most subtitle-phobic of kids. Bonus points for not having any princesses. Highly Recommended.